When Kasie West puts out a new contemporary book, I’m always excited. Her stories always captivate me and her characters just leap off the page. Once I start one of her books, I have trouble stopping, and find myself constantly laughing out loud. Although I had a few issues with By Your Side, it still contained the Kasie West staples I know and love. Overall though, I feel mixed about this book. On one hand, By Your Side was fun, heartfelt, and enjoyable. I felt instantly interested and didn’t want to put the book down. The characters were sweet, the romance engaging, and the writing as light and readable as ever. On the other hand, I wanted more: more character development, more family dynamics, and more discussion of anxiety and the different intersections of it. There was so much potential here that I felt was wasted by focusing on Jeff’s recovery and Autumn’s indecisiveness. This focus created repetitiveness, and a lack of character development and growth. The issue I had most with this book was the anxiety rep. I never felt Autumn’s anxiety. I don’t think it was ever fully developed. I truly believe that with more research and on page discussion of anxiety and how anxiety disorders manifest themselves, this book could have been a great conversation starter. I am someone who suffers from debilitating anxiety, and although everyone with an anxiety disorder experiences it differently, I never fully bought Autumn’s. It always felt abstract. I will say, I did appreciate the positive portrayal of both medication and therapy. It’s incredibly important to break the stigma on mental health. I even appreciated that anxiety was a subplot in the story. I’m sure there are other people who suffer from anxiety disorders that will like the portrayal in By Your Side but I, unfortunately, just found it to be lacking. Even though I had some issues with it, this book was great. Kasie West is my go-to author when it comes to light, heartwarming romance books and By Your Side was no exception. I thought the romance between Autumn and Dax was genuine, and developed well. Their time learning about each other in the library was enjoyable to read. I wish we got a little more development on Dax’s family life, but I still felt the impact his upbringing had on the story and his character as a whole. I was sympathetic towards Autumn, want just wanted what was best for her throughout the book. I honestly devoured this book and, considering I’ve been in a huge reading slump, that’s saying something. 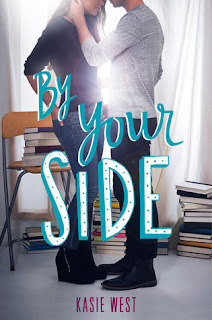 By Your Side was a fun, sweet read with great characters and immense readability. Although I wished for more in some aspects, I know reader’s picking up By Your Side looking for another great Kasie West book will not be disappointed!